US, 1995, 90 minutes, Colour. Jim Carrey, Ian Mc Neice, Simon Callow, Maynard Ezrahi, Bob Gunton, Sophie Okonedo, Tommy Davidson, Adewale, Bruce Spence. With Ace Ventura, Pet Detective being so successful at the box office, it was not surprising that there should be a sequel almost immediately after – and capitalising on the success of The Mask and Dumb and Dumber. Jim Carrey brings all the characteristics that he developed in the first film, his appearance, facial and bodily mannerisms, the leering touch and the innuendo, the bodily contortions… His best understood if he is interpreted in as an responded to as a clown.As before, there is a lot of physical comedy, plenty of pratfalls – and, this time, plenty of animals to have pratfalls with, culminating in an elephant trampling through cars, houses. The film was written and directed by Steve Oderkirk who worked on the previous film. With an eye to the various adventure film set in Africa, from King Solomon’s Mines to Hatari, Ace Ventura is on a mission to rescue animals in Africa, getting a commission to find a particular bat which is sacred to a tribe and, with its disappearance, possibilities of fierce warfare with a neighbouring tribe (fostered, of course, by the unscrupulous colonial governor to make money out of white guano). The villain is played, of all people, by classical actor and writer, Simon Callow, great White Hunter, a crook, very very British. And his offsider, playing the straightman to Carrey’s antics, is Ian Mc Neice. Bob Gunton appears as a local dealer and added villain. Australian Bruce Spence is a lanky Australian poacher. 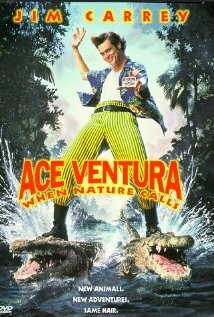 While there is a lot of African scenery and animals, and plenty of tribal sequences with bad translations from English, poison darts, feats of endurance demanded by the tribe, being swallowed by a rhinoceros…, there is the usual escapades for Ace Ventura. There is a touch of romance, even with some lewd innuendo, with the Princess of the tribe attracted to Ace. She is played by stage actress, Sophie Okonedo. This film is slight compared with the original but was successful with its intended audience. The committee for the Razzie Awards was very unkind to the film, nominating its producer, James Robinson, for worst sequel. The Stinker Bad Awards gave it Most Painfully Unfunny Comedy, Worst Sequel, with nominations for Worst Actor, Jim Carrey, Worst Film and Worst Sequel and The Sequel that Nobody Was Clamouring For!